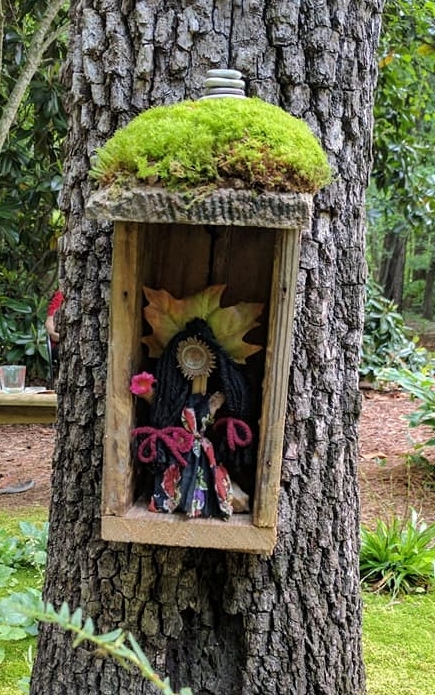 It has been a year since our beloved friend Mary Barakha died, and the beautiful garden sprite she had created that hung in the little spirit-house we made for it in the Moss Garden, had gotten weathered. It seemed a good time to recreate this spirit-house as an ancestor shrine, sensing that Mary has joined with and is surrounded by loving ancestors. On the little moss roof we placed a metal wren, a spirited little bird, to carry our prayers. We placed in the spirit-house a lovingly crafted, spritely heart and a small ceramic dish for little objects of remembrance. 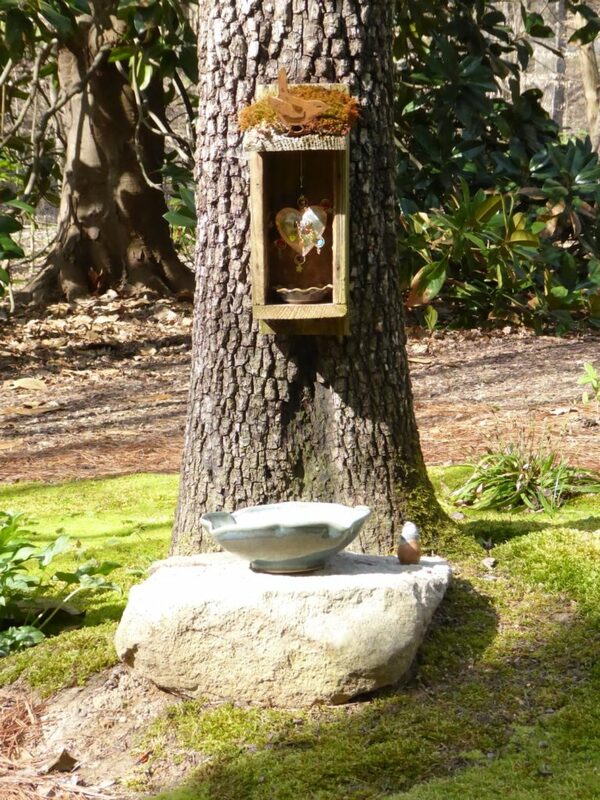 Under this shrine we put a rock altar, envisioning that we could sit or kneel on the soft moss to make our prayers. A few days later my friend Nancy was coming over for a visit. 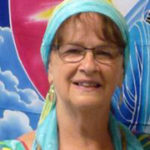 She shares with me an interest in fostering the connection of people, earth and spirit. I suggested to her that we each bring an offering and do a small ceremony at the new ancestor shrine in the Moss Garden, as my teacher, Daniel Foor, had taught us to do in a recent ancestral healing workshop. I put a bowl of rich soil on the altar. When she arrived I suggested that we each call to mind a loving ancestor, then think of a question on our hearts, and place it as a prayer into the earth that is our ancestors. Then we would add our ritual offerings as expressions of gratitude. 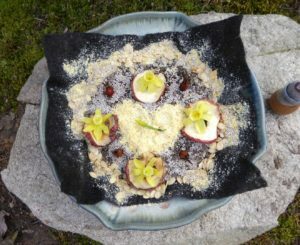 As her offering, my friend made a design with cornmeal and squash seeds, with a heart in the middle. After making my prayers, I added dried apple slices and tiny hawera daffodils, gathered from the moss, placing a little daffodil bud in the heart. I sprinkled water from a little jar on the altar that had collected rainwater. This was a simple, homespun act of creating beauty, almost as if “when two are gathered” and make an offering, they can’t help but create beauty. She said for her it was healing. After she left I took the offering and folded it into the compost, our questions and prayers to be digested. I had no idea that doing this simple little ritual together would leave me with such a calm, sweet, lighted feeling. I felt whole. I’m grateful to Mary Barakha, to Nancy, to Daniel, to the moss beings, and to the Loving Ancestors. Now I’m wondering what contributed to feeling such a sense of wholeness. Perhaps it was because our ritual involved both of Jung’s polarities, instinct and image. Instinct included the physical acts of gathering the ingredients and making the offering, bodily expressing our prayers. The instincts of loving and longing were expressed in the creative, mandala-like image. A mandala is itself an image of healing and completeness. The feeling of wholeness also came from the joining of us people with nature and with spirit. Before the ritual we had walked in the woods and greeted the spring ephemeral wildflowers that were blooming there. We had laid down on the lush mosses, gazing up at the slowly moving clouds and high, soaring birds, and expressed gratitude for all of them. We made our offerings using ingredients from nature. Is it any wonder that being reverently with both nature and spirit makes us feel whole and healed! Thank you, Halima. Your words complete the offering so beautifully. Ohhhh Betty Lou! I so love your honoring of Mary. She was dear to so many, one who welcomed everyone with love and, if they were willing, a strong hug. To me, the wren seems just right as a symbol for her and her journey. Wren – industrious, curious, with an enchanting song, willing to nest as often as needed for the good of the brood, going from one to another as the situation called. And of course the interplay of instinct and image is what we do in the dances. It’s something I strive for. Thank you for sharing this, another one of your deeply beautiful rituals. Mariah, dear, thank you for pointing out the similarities between Mary Barakha’s industriousness and the wren’s! Come to think of it, wrens are outspoken, too, their voices so penetrating for such a little bird. Makes me think of Barakha’s announcements with their tell-it-like-it-is droll humor. We do try to make each dance a ritual, don’t we. Love and blessings on you, too, dear Parjanya! I can see Mary Bharaka smiling and overjoyed. How wonderful for her, to be remembered and honored in this way. Thank you to Mary, to Hakima and all involved. Yes, Vrinda, I can see her smiling impishly from amongst the flowers, herself a garden sprite. May she always be surrounded by the flowers and birds she loves. Yes, I have participated in despacho rituals in which the prayer filled mandala is bundled and burned to send to the spirits. Kathleen, thank you for joining with us by letting yourself imagine all these ways that we as humans naturally play and create. Maybe that’s another reason that ritual can feel so timeless, because we are touching into our ancient human family circle. How perfect to follow the path of the Ancestors, being led as called, following Spirit as asked, and creating as your own heart now asks…I can see the spirit guides nodding, smiling and wrapping themselves around all of you with immense love. Each day in every way may we all embrace ourselves in similar fashion. Aho! Suz, you wisely and intuitively sense that, yes, there were loving energies, loving spirits, leading this ritual of connection to the unseen world, to Mary. I sensed their presence, in part, because several synchronicities accompanied it. May you feel the embrace of Love at all times. As you always do, your lovely ways found peace in your garden which extended to peace in my heart. I too love to tend my outdoor ancestral altar. Blessed be. 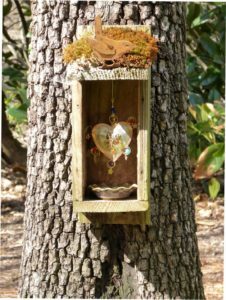 Sharon, I hope we will get to share our natural world spaces and altars someday, and do ceremony together. And, as always, thank you for your tender words. Hi Sandra! You as Gardener and Artist know that Love, blessing and peace are the gifts of EarthSpirit to all. Once again, I am in awe of your exquisite creations in the natural world. You continue to bring beauty into our lives. What a wonderful way to honor your friend, Mary. Jill, my friend, also a bringer of the beauty of the natural world to our community, we hope to do more inspired ritual in the Sanctuary. We’ll certainly let you know when. That’s beautiful Betty Lou, really nice work on honoring your friend and the land/Earth at the same time and in that way affirming their inseparability. Lovely, spirited, thanks also for sharing! Thanks, Daniel. I look forward to deepening in Animism study and experiencing with you. Very beautiful. Thanks to everyone who contributed to this exchange. May you be blessed. Thanks, Tana! Looking forward to spending some time in the Moss Garden with you soon. Thank you for sharing this beautiful ritual that you and Nancy evoked from Mary Barakha’s spirit! Two things stand out in my heart about my time with Mary Barakha. The first was her welcoming spirit and tremendous loving Sufi hugs! The second was her embracement of life and death. Her garden was full of annual and perennial flowers/plants, each birthing from the soil she tended to, to fiercely loving each and every flower/plant, to bringing to the fruition their love (her love) to The Dances, and then returning them back to earth. Those flowers filled me with love, harmony, and beauty! Additionally, there was her “bone yard”. Her “animal totems” were an exquisite celebration of the beauty that death reveals. This was a sanctuary for me – for all the ancestors that have passed and all who will be renewed. Thank you, Mary Barakha for these gifts that you gave me. Arianna, thank you so much for contributing these lovely memories of Mary Barakha and her connection to our beautiful Earth! How beautiful to read of this, today, as I begin to navigate the warmer dry weather in southern CA. To imagine lying down in green mosses, to make an offering in this gentle way. Thank you for your description and the exquisite photos! Yes, the mosses are always inspiring of richness, intimacy and connection. Their verdant greenness is soothing. Imagine them moist and cooling when you lie down on them!